Abraham’s Camels. Did camels exist in Biblical times? 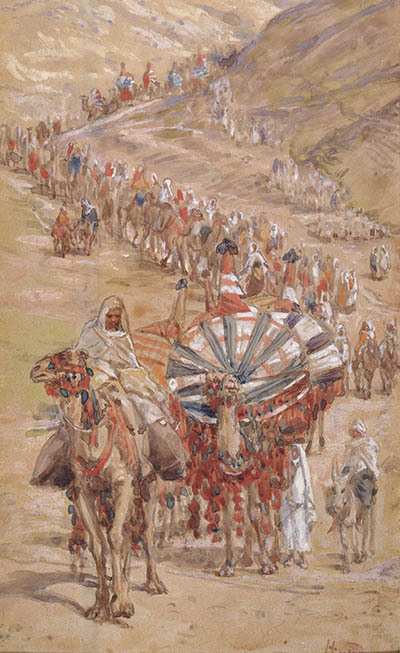 Camels appear with Abraham in some Biblical texts—and depictions thereof, such as The Caravan of Abram by James Tissot, based on Genesis 12. When were camels first domesticated? Although camel domestication had not taken place by the time of Abraham in the land of Canaan, it had in Mesopotamia. Photo: PD-1923. In the Bible, Abraham’s nephew Lot accompanies him from Haran to the land of Canaan (Genesis 12). However, Abraham and Lot eventually separate because the land cannot support both of their possessions, animals, and servants. Abraham allows Lot to pick first the area where he would like to settle. After surveying the surroundings, Lot chooses the well-watered plain of the Jordan River to the east (Genesis 13:11). Abraham then settles in Canaan west of the Jordan River. Later we learn that Lot is living in Sodom, one of the cities of the Jordan plain (Genesis 14:12). This Biblical episode seems fairly straightforward. A modern reader may consider Lot’s choice to be neutral, perhaps prudent, or maybe even selfish—but probably not wicked. It may then come as a surprise that ancient Jewish and Christian interpreters often attributed sinister motives to Lot’s choice. All of these interpretations read sinister motives into the text. By highlighting Lot’s selfishness, greed, and lust, Abraham appears generous and righteous. Genesis 13 states Abraham’s desire for him and Lot to separate but says nothing about Lot’s desire to separate. Some modern readers have noted that Lot’s lack of a counterproposal or deferment to Abraham might indicate his cunning manipulation. Maybe, however, Lot’s response demonstrates his submission to his uncle’s wishes. Perhaps he wants to journey a safe distance from Abraham’s herds to avoid further strife. Or perhaps Lot really has no interest in Abraham or the God that he serves. Lot may be a misunderstood, maligned character. Even if cunning and manipulative, he is certainly not the sinister villain painted in many ancient sources. 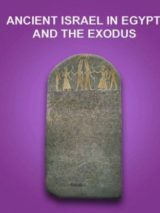 Learn more about ancient interpretations of Lot’s character in Dan Rickett’s Biblical Views column “Safeguarding Abraham,” published in the January/February 2019 issue of Biblical Archaeology Review. Subscribers: Read the full Biblical Views column “Safeguarding Abraham” by Dan Rickett in the January/February 2019 issue of Biblical Archaeology Review. 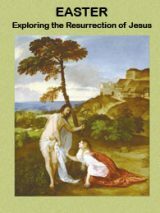 Yet another article from BAG and a writer which basically present the Bible and Church history from a secular perspective. Lot was called righteous for the same reason that Abraham or any person is: He believed in God. Apart from God he was wicked. And the Bible makes it quite clear he was more carnally minded than Abraham. The real point of this article is to attempt to cast doubt on the infallibility of the Bible. Michael, you seem to have a bias that you’re not aware of. The intent of the article is to show a view of lot that is not often represented. As the article pointed out, Lot is viewed as a cardinal person, but the Word definitively calls him “righteous Lot.” Are all of us guiltily of slandering Lot’s character? If the hypothesis that Lot was a greedy and grasping man opposed to Abraham and his God, why was it that — after listening to Abraham’s plea for the righteous people of Sodom to be saved — was a pair of angels sent to Lot to warn him of the impending destruction? He and his wife and daughters were apparently the only people saved from the destruction of that wicked city. Any suggestion that he lived in Sodom so he could be like the Sodomites is put to rest when he offers his daughters up to the mob to protect the angels from their sexual advances. Up until their escape from Sodom and the destruction of that city and its sister city, Gomorrah, Lot was seen as a righteous man who, like his uncle, worshipped the God, Jehovah (Yahweh). It was his descendants who turned away from worshipping the God of their father and uncle. The Moabites and Ammonites who switched to worshipping the god, Chemosh. excellent, that’s why it pays to read for oneself. I think we want very simplistic views of everything as evil v. good. We see it in modern politics. They aren’t just wrong they are bad. But most of us make bad choices out of good intentions. We don’t intend to do badly, we just choose poorly. Maybe we want Lot to be evil because we can ignore that he did what many of us would have done, chosen the good land. If he is evil, his misfortunes lay in his evil intent (which of course, I don’t have) not in making a bad choice that any of us might have made.